With 13 Hours: The Secret Soldiers of Benghazi opening this weekend, a few days ago I sat down with director Michael Bay in Miami for an exclusive video interview. He talked about the responsibility of telling a story about real life heroes, memorable moments from filming, why they used digital cameras, his first cut of the film, future Transformers movies (including if Transformers 5 is his last one and spinoff films), and a lot more. 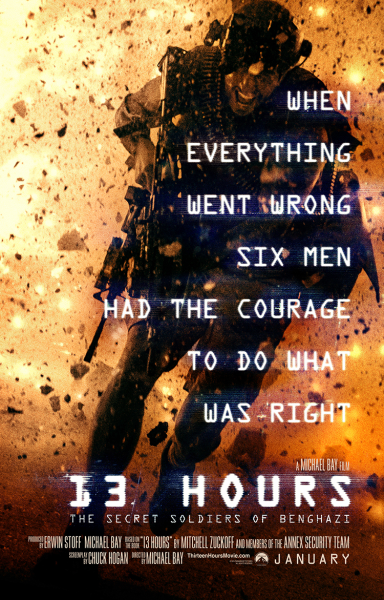 If you’re not familiar with 13 Hours, the film tells the story of the members of a security team tasked with surviving the chaotic events on September 11, 2012 after the attack on the United States embassy in Benghazi, Libya that led to the death of four Americans, among them Ambassador Chris Stevens. The movie is adapted by Chuck Hogan from Mitchell Zuckoff’s book, and stars John Krasinski, James Badge Dale, Max Martini, Pablo Schreiber, and David Denman. While Benghazi has been in the news since the tragic events unfolded that night, few have talked about the real life heroes that saved countless lives. While you might be surprised to hear this, Michael Bay has done a great job telling their story without politicizing the issue or “Hollywoodizing” the events. It’s easily one of his best films and absolutely worth your time and money. Check out what Bay had to say about the making of the film below. The reasonability of telling a story about real life heroes. What kind of cameras did he use and why? How long was his first cut of the film? His thoughts on the Transformers writers’ room where they had a bunch of people breaking story for the next few films.